Posted October 15, 2018 by Angie Ball & filed under Personal Perspective. Halloween is fun for many kids and families, but vandalism, property damage and insurance claims increase during Halloween. Protect your property this October with these tips. Reduce the risk of a burglary when you turn the lights on and make your home look occupied. Consider installing motion sensor lights, too, to deter criminals. See what’s happening around your property with security cameras. You can also install a doorbell camera to determine if trick-or-treaters or tricksters are on your porch. Even if you’re home to pass out treats, lock your doors and windows. Don’t give burglars the chance to enter the back of your home while you sit out front. Don’t keep valuables in plain sight. Remember to hide your new TV box and similar items, too. Make friends with your neighbors to improve security on your block. You can watch each other’s homes and deter or report suspicious behavior. Loose branches, kids’ toys, extension cords, and other debris can cause trips or falls. Spend time cleaning up your yard and porch as you reduce this risk. Install lighting along your sidewalk and porch to prevent trick-or-treaters from tripping. A well-lit property also deters criminals. Jack-o’-lanterns are traditional decor, but open candle flames can start a fire. Use flameless or battery operated candles instead. Protect your shed, garage and other outbuildings, along with the items they store, from vandals and thieves. Padlock the doors, lock the windows and tie down valuables inside. Greet trick-or-treaters from your front porch or yard. While friendly, this action allows you to watch your property and prevents visitors from entering or casing your home. Prevent your pets from escaping or running away when you secure them in a crate or interior room. If vandals target mailboxes in your area, bring yours inside. You may also wish to tape your mail slot closed to prevent unwanted mail in your home, such as smoke bombs. Protect your vehicle from vandalism and theft when you park it in the garage. Lock the doors and turn on the alarm, too. Alternatively, use a local parking garage or park in a populated or other secure space. If your home is damaged during Halloween, you can file an insurance claim. Update your policy now. Be sure it covers vandalism, fire damage and liability. With these tips, you protect your home this October. They can improve the safety of your property during Halloween. Homeowners insurance protects your home if it’s damaged from a storm, theft, vandalism or other disaster. Save money on your homeowners insurance policy in eight ways. You may cut premium costs when you make your home more resistant to disasters. Reinforce the roof, install storm shutters and trim trees. Consider upgrading your home’s electrical, heating and plumbing systems, too, as you reduce fire and water damage risks. With these steps and others recommended by your insurance agent, you may cut insurance costs. Certain security upgrades reduce your insurance costs. 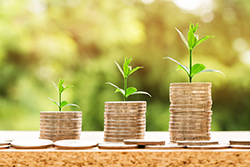 For example, you could save up to 20 percent if you install a fire and burglar alarm or sprinkler system that connects automatically to a monitoring station. A burglar alarm, deadbolt locks or smoke detector installation could cut costs by five percent. Before you make these upgrades, verify that the system you wish to install does qualify for an insurance discount. Every year, schedule an insurance review. Verify that your policy covers the value of your home and the possessions you currently own. You may find that you don’t need riders for expensive collections you recently sold, or you may need to increase policy limits to cover a recent remodel. When you know exactly how much homeowners insurance you need, you can shop for an accurate quote. Your insurance rates depend in part on your credit score. Pay your bills on time, keep credit balances low, and correct all credit report errors. Increasing your deductible from $500 to $1000 can lower your annual insurance rates by 25 percent. Discuss your budget and needs with your agent as you choose your deductible. Most insurance companies don’t advertise the discounts they offer, but you can ask. You may save money if you’re home more often and able to spot potential trouble sooner. Your age or professional organization membership could also qualify you for a discount. If you buy your homeowners insurance and auto insurance from the same company, you may qualify for a five to 15 percent discount. Crunch the numbers, though, to ensure you get the best price on both policies. Most insurance companies reward loyal customers with discounts of up to 10 percent after six years of consecutive coverage. However, you may find cheaper rates and reliable service elsewhere. Request quotes from independent insurance agents and compare coverage options and rates as you find the most affordable homeowners insurance. With these eight tips, you save money on your homeowners insurance. For more details, talk to your agent. Posted October 15, 2018 by Angie Ball & filed under Unregistered. Winter is almost over, but a variety of risks affect your safety as you drive. This month, perform a maintenance check on your vehicle as you improve safety and reduce accidents. Improve traction on slippery, snowy and cold surfaces with maintained tires. Check the tread, and inflate the tires based on manufacturer’s recommendations. While you want to drive cautiously in winter weather, you also need a quality brake system. Check the entire system and replace worn parts as you ensure your vehicle’s brakes operate efficiently. Cold weather can compromise your vehicle’s battery performance. Volt test the battery to verify that it’s working properly, and check the connections. If your battery is weak or older than three years, replace it and prevent the chances of being stranded in cold weather. Numerous fluids protect your vehicle and help it operate properly despite plummeting temperatures. Gasoline – Keep the gas tank full to prevent the fuel pump from freezing and to help you stay warm if you’re stranded. Oil – A low-viscosity oil flows easily through your engine. Check the oil level, too, to keep your vehicle operating properly. Coolant – Fill the coolant reservoir with a solution of 50/50 antifreeze and water, and inspect the engine for leaks to ensure your engine doesn’t freeze. Washer Fluid – Top off the washer fluid so you can remove debris and slush and see properly as you drive. Daylight may last longer now, but your visibility can decrease when you drive at night or during storms. Replace broken light bulbs, restore foggy or yellowed headlights and replace wipers if necessary. To keep your windows clear of snow, ice or fog and to keep you and your passengers warm, check your vehicle’s defroster and climate control system. If you notice anything wrong with the performance of these essential features, visit your mechanic for a repair. 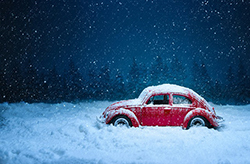 Maintaining your vehicle this winter can improve your safety and reduce accidents. In addition to vehicle maintenance, talk to your insurance agent. Update your auto insurance policy to ensure it covers accidents, and discover additional ways to improve safety as you drive this winter. When you’re in the market for a vehicle, you want to choose a reliable car or truck. Dealerships or private owners may inadvertently or purposefully try to sell you a vehicle that’s been recovered from a flood, though. Protect yourself when you know the signs of a flooded vehicle. 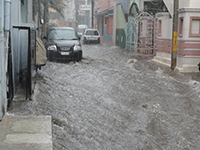 Car buyers of all experience levels can look at a vehicle and see several signs of flood damage. Flooding can deposit dirt and mud throughout the vehicle. Check for this flood evidence under the hood, inside the car, on the seat tracks, in the glove compartment, and on the undercarriage. Discolored or stained carpets and upholstery in the trunk or lower section of the car may indicate that the vehicle sat underwater. Other flood signs include new carpets or upholstery in an older car. If you smell a musty aroma when you sit in the car or turn on the air conditioner, the car may have survived a flood. A strong cleaning solution or air freshener scent may also indicate that someone tried unsuccessfully to remove mold or mildew. Visible water lines on a vehicle may indicate that it sat underwater. Check the headlight lenses, reflectors, interior upholstery, and trunk for this evidence. Unpainted metal and exposed screws will quickly rust when exposed to water. Look all over the vehicle for these and other signs of rust. When a vehicle floods, the owner may remove the rubber drain plugs at the bottom of the doors and under the car and drain the water. Inspect these two areas to ensure the drain plugs remain intact. A vehicle damaged in a Florida flood could show up for sale in Oregon with no visible signs of damage, so ask a certified mechanic you trust to inspect the vehicle before you buy it. The mechanic can check the internal engine parts for evidence of electrical or mechanical water damage. Before you purchase a vehicle, do an online search. Start with the National Insurance Crime Bureau (NICB) website. Here, you can review the vehicle’s VIN and see if it was ever involved in a flood damage claim. You can also search the CARFAX website for details about a vehicle’s history. Whether you purchase from a dealer or an individual, research the seller before you sign a contract. Read online reviews online or ask previous customers for honest feedback. With this checklist, you can avoid buying a flooded vehicle. You can also contact your insurance agent for information about potential vehicles before you make a purchase. Posted October 12, 2018 by Angie Ball & filed under Workplace Safety. Across the country, temperatures plummet during cold winter months. Many employees must work outdoors and face injury or even death because of the weather conditions. Protect your outdoor workers with several safety precautions. Employees who only spend a short time outside could also be in harm’s way, though, if they don’t prepare properly for the conditions. Cold air temperatures, high winds, damp air, slippery surfaces and contact with water threaten your outdoor employees. Winter weather dangers also include frostbite, hypothermia, increased strain and injury risks, dehydration, decreased performance and other health and safety challenges. Assess the dangers your outdoor employees face, and then implement safety protocols that protect your team. If the forecast calls for cold temperatures, high winds, snow or ice, alert employees. Ensure they take appropriate safety measures. Clothing provides employees with a defense against winter weather. To stay warm, ask your employees to follow these clothing tips. Wear three layers. An inner insulating layer traps perspiration, a middle layer protects the body from precipitation and an outer layer allows ventilation and prevents overheating. Fabric matters. Wool, silk or certain synthetic fabric, rather than cotton, keeps skin dry even in wet weather or when perspiring. Loose is better. Tight clothing can trap moisture and lower body temperature. Remember the extremities. A hat, gloves, two pairs of socks and insulated shoes protect head, hands and feet. Pack extra clothing. If an accident happens, your employees can change clothes and get dry and warm. Stay alert to body changes. Ask your employees to look for symptoms of frostbite, hypothermia, dehydration or other problems. They should report tingling, itching, burning, pain, sluggishness, aggressive shivering, disorientation and slurred speech to their supervisor. The right diet fuels employees and helps them stay safe and alert. Adequate fluids prevent dehydration, and a balanced diet improves focus and energy. Employees should avoid alcohol and tobacco as these substances can impair thinking, constrict blood vessels and restrict blood flow, which increases heat loss and affects the body’s ability to warm extremities. Harmful UVA and UVB rays can cause sunburn in any weather. Provide sunscreen for all employees to wear on exposed skin. Promote safety this winter for your outdoor employees when you follow these tips. 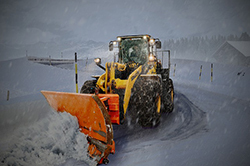 For more information on outdoor work safety, access OSHA’s winter weather resources.